This appetizer is mostly carbohydrates due to the toasted bread. Enjoy one or two before a meal high in protein and moderate in fat. Preheat oven to 400°F. Place cubed eggplant on a roasting pan. Lightly mist with cooking spray and season with salt and pepper. Roast in oven until tender, about 20 minutes. Remove from oven and allow to cool to room temperature. Spray a small skillet with cooking spray and add vegetable broth (or water). When hot, add mushrooms, onion, and garlic and sauté. *Note: Add more water or broth as needed until mixture is tender. * Allow to cool to room temperature. When mushrooms and eggplant are cooled, place all ingredients in a food processor and roughly chop. Top each crostini with an even amount of the mixture. If serving right away, grate parmesan cheese over each piece and place under the broiler for 1 minute. Serve warm. This dish can also be made early by making the mixture ahead of time and storing it in the refrigerator. 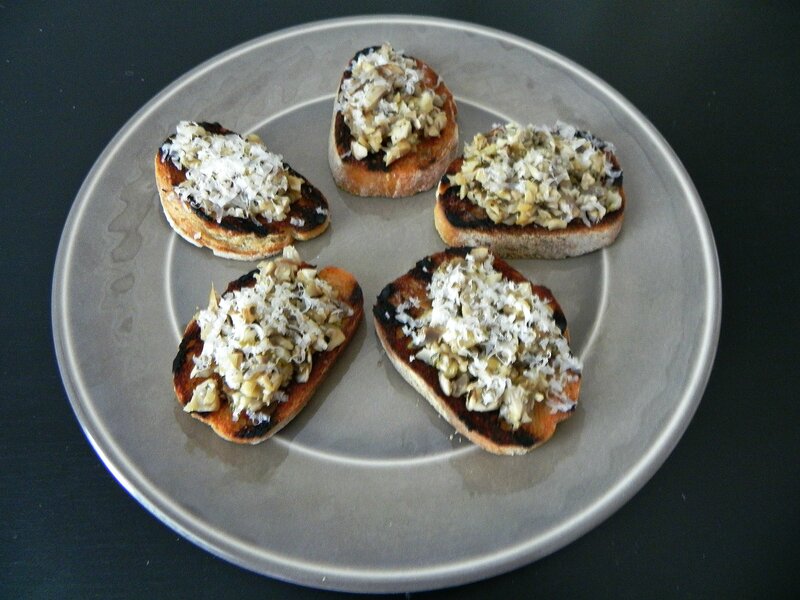 When ready to serve, toast the bread, top with eggplant and mushrooms, heat under broiler and serve.